Give any space character with this unique rustic tree artwork. Artwork reads, "Family, like branches on a tree we all grow in different directions yet our roots remain as one". 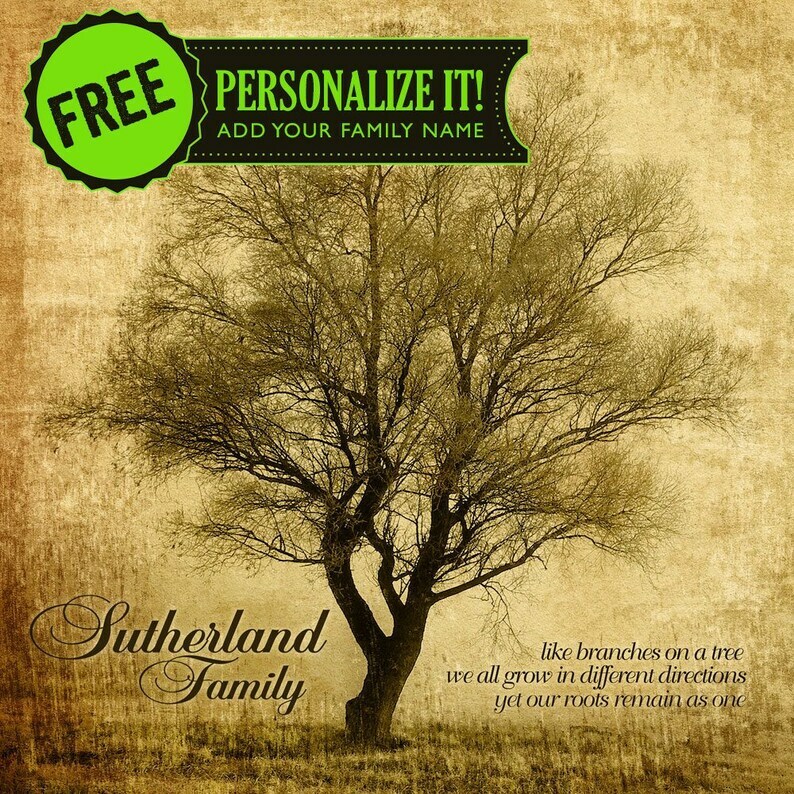 Personalize it with your family name if desired for FREE. I can design this to any custom size (extra charges may apply). Your choice of 18x18", 20x20" 24x24, or 36x36""
For all personalized orders, an electronic proof will be sent to you for approval to ensure your satisfaction before printing. This makes a great gift idea. Many realtor's order this for their client's as a meaningful house warming gift. Artwork is printed on quality 1 5/8" thick cradled wood panel that is ready to hang on the wall. This item usually ships 5-7 business days after proof approval. "This was a gift for my grandpa! He loved it! super great quality, too! Well made!" "The fact that it could be customize made this gift for my parents even more special." "I had this item personalized as a gift and it was exactly what I was hoping for. The print is beautiful and loved by the recipient! Michael was very helpful and responded to my questions very quickly. When I have future needs for something similar I will be purchasing from Anything Photos again!" "A unique and beautiful piece of art! Michael was always quick to respond and was very accommodating. This was shipped/delivered quickly as well." "Excellent quality! I inquired about this print and needed it personalized in a very short time frame. Michael went above and beyond to make sure I received this item on time! It is a unique gift that the couple will not receive from others. There were multiple compliments. Thank you for going above and beyond to make this special gift purchase happen in the short time frame requested of you. Your professionalism was appreciated throughout the process with the final product being of great craftsmanship!" "This turned out better than expected! I bought it for a Mother's Day gift and she loved it! Great work." "This fits in the space I needed to fill perfect. You can tell that great care went in to the craftsmanship and packing of the item. I love it!" "I couldn't be happier!! Wonderful artwork, careful packaging and fast shipping! I will definitely recommend your services. Thank you so much for this wonderful addition to our home."